A collection of studies on mental health services in Ireland, from the beginning of the 19th century to the present, the first time such a chronology has been published. Or buy the eBook > ISBN:9781911024620. Categories: 20th Century History, 19th Century History, Medical. This book is a collection of studies on mental health services in Ireland from the beginning of the nineteenth century to the present day. Essays cover overall trends in patient numbers, an exploration of the development of mental health law in Ireland, and studies on individual hospitals – all of which provide incredible insight into times past and yet speak volumes about mental health in contemporary Irish society. Topics include the famous nursing strike at Monaghan Asylum in 1919, when a red flag was raised over the building; extracts from Speedwell, a hospital newsletter, showing the social and sporting life at Holywell Hospital during the 1960s; an exploration of diseases such as beriberi and tuberculosis at Dundrum and the Richmond in the 1890s; the problems encountered by doctors in Ballinasloe Asylum as they tried to exert their authority over the Governors; and the experiences of Irish emigrants who found themselves in asylums in Australia and New Zealand. The book also includes a discussion of mental health services in Ireland 1959–2010, the first time such a chronology has been published. 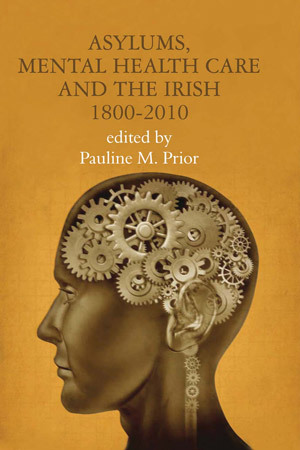 The editor, Pauline Prior, and the contributors, including Brendan Kelly, Dermot Walsh, Elizabeth Malcolm and E.M. Crawford, are well-known scholars within the disciplines of medicine, sociology and history, coming together for the first time to present an essential book on the history of mental health services in Ireland. Pauline Prior is Senior Lecturer in Social Policy at Queen’s University Belfast. Her most recent book was Madness and Murder: Gender, Crime and Mental Disorder in Nineteenth-Century Ireland (Irish Academic Press, 2008).